New York Times bestselling author Jennet Conant presents this stunning account of Julia Child’s early life as a member of the O.S.S. 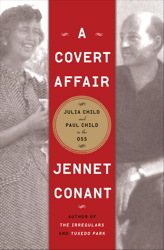 in the Far East during World War II, and the tumultuous years when she and Paul Child were caught up in the McCarthy witch hunt. When the news was first released in the fall of 2008 that Julia Child had secretly worked for the O.S.S. the announcement made headlines across the country. Julia Child’s legions of fans were shocked. Now, there is an enormous amount of new material available to flesh out this fascinating story. Julia Child’s O.S.S. files as well as those of her husband and many of her closest friends in the service, have recently been declassified. Conant has written a wonderful and meticulously researched account about three young women who were recruited by the O.S.S. in Washington and sent to remote outposts in the Far East. The bright and often eccentric 6’ 2” Julia springs to life, like a privileged and naïve heroine out of an Edith Wharton novel and follows her personal and political coming of age in Ceylon and China, and the life altering romance at thirty-four with the much older and more worldly Paul Child. The dramatic experiences of Julia’s close friend Jane Foster, a charismatic blue-eyed blond O.S.S. agent, casts a provocative light on those nightmarish postwar years. During the height of the McCarthy red hunt, Foster was accused of being a spy. Suspicion quickly fell on her closest friends. Julia and Paul Child, who stayed loyal to Jane Foster, left the diplomatic corps and found a new line of work, and the rest, as they say, is history.